San Marcos (LSD-25) was laid down on 1 September 1944 at the Philadelphia Navy Yard launched on 10 January 1945 and commissioned on 15 April 1945 Comdr. L. E. Ellis in command. San Marcos a landing ship dock completed shakedown in early May took on a cargo of landing boats; and on the 19th sailed for the Panama Canal and Pearl Harbor. Arriving on 24 June she transferred her cargo of 40 boats loaded a similar cargo and departed on the 29th. After taking on dredging equipment at Guam she anchored in Buckner Bay Okinawa on 12 August -- three days before the cessation of hostilities. On the 15th she shifted to Naha repaired LCT's through the 20th then proceeded to Saipan. There she loaded LCM(6)'s LCVP's and LCP(L)'s for use by occupation forces in the Tokyo Bay area; and on 4 September she arrived in Japan to offload her cargo and commence operation and maintenance of a boat pool. In early December she was reassigned to cargo operations; and through the end of the year she ferried boats from Aomori to Yokohama. In January 1946 San Marcos was assigned to Joint Task Force 1 (JTF 1) for Operation "Crossroads " the series of atomic tests scheduled for Bikini during the summer. She first shifted south to Okinawa; then in February moved east to Kwajalein whence she helped to prepare the test site. She remained in JTF 1 through the July tests and on 29 August she was detached. In early September the ship moved from the Marshalls to Hawaii; and in October she arrived at San Francisco. Granted provisional radiological clearance she resumed cargo operations along the west coast in early November; and by the end of the month was carrying supplies boats and vehicles to the Aleutians. In December she put into the Navy Yard at Bremerton; received final clearance in January 1947; and in the spring resumed cargo runs between the west coast and the Aleutians. She terminated those operations in September and proceeded to southern California where her capabilities as a temporarily converted seaplane drydock were tested. In December she commenced inactivation and on the 19th was decommissioned and berthed with the San Diego Group of the Pacific Reserve Fleet. After the outbreak of war in Korea San Marcos was ordered activated. Recommissioned on 26 January 1951 she completed shakedown in March was assigned to the Atlantic Fleet's Amphibious Force and in May sailed for the Panama Canal and Little Creek Va.
She arrived at the latter in late May and soon thereafter commenced arctic summer resupply operations under MSTS to bases in Canada and Greenland. With the fall she moved to the Caribbean for fleet exercises. then returned home. In November she shifted to Baltimore for a shipyard overhaul and with the new year 1952 resumed active duty. Caribbean exercises took her into March. In April she departed Norfolk embarked fleet marines and their equipment at Morehead City and headed east for her first Mediterranean deployment. She transited the Straits of Gibraltar in early May and operated with the 6th Fleet ranging from the south of Franee to Benghazi and Phaleron Bay into October. She then recrossed the Atlantic and after disembarking the marines in North Carolina proceeded to Little Creek. She resumed east coast operations with a joint Army-Navy exercise in November. During 1953 San Marcos conducted exercises and carried cargo along the east coast and in the Caribbean and underwent overhaul at Boston. Winter spring and fall of 1954 saw a continuation of those operations including a reserve training cruise while the summer brought a return to arctic waters for resupply missions. In January 1955 she proceeded again to the Mediterranean. Completing that deployment in May she resumed a schedule of east coast Caribbean and -- during the summers of 1956 and 1957 -- polar logistic support operations. In September 1958 she again deployed to the Mediterranean for a six-month tour with the 6th Fleet. She rejoined the 2d Fleet in March 1959; and in May tested recovery methods for project "Mercury." During the summer she participated in Operation "Inland Seas " conducted in the Great Lakes and made possible by the opening of the St. Lawrence Seaway. Amphibious force exercises and local operations occupied the remainder of the year. Throughout the 1960's and into the 1970's San Marcos rotated regularly between the 2d and 6th Fleets. While with the 2d she participated in exercises and carried cargo and personnel from New England to the Caribbean. Severing of diplomatic relations and increased tension between the United States and Cuba and political unrest in the Dominican Republic brought extended operations in the Greater Antilles in early 1961. 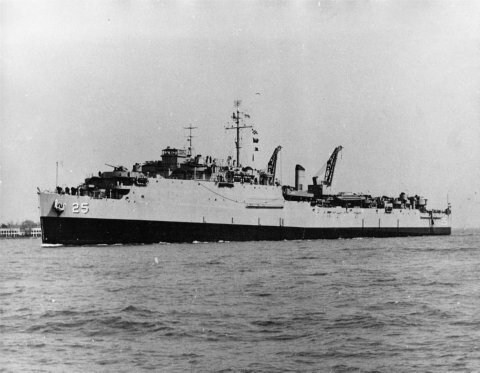 Those operations were followed by duty in support of project "Mercury"; and in September she received modifications which added helicopter operations to her capabilities. Then a five-month FRAM II overhaul in 1962 and 1963 modernized her equipment and living spaces and improved her operational abilities in transporting launching and controlling assault craft; besides providing drydocking and repair services to landing ships and craft. Her annual -- excluding 1964 -- Mediterranean deployments brought participation in fleet binational and multinational (NATO) exercises. In 1964 she deployed only briefly in September to participate in Operation " Steel Pike " a large-scale amphibious operation held off the coast of Spain. On 13 August 1970 the LSD returned to Little Creek to complete her last Mediterranean tour. Local and Caribbean exercises took her into 1971 when she was designated for transfer to the government of Spain. The first detachment of her future Spanish crew arrived in mid-April; the remainder joined her on 30 May. June was spent in familiarization activities and on 1 July 1971 San Marcos was decommissioned transferred and recommissioned in the Spanish Navy as Galicia.